Our homes are arranged, decorated and styled to reflect our personal needs, values and tastes. For many, their home is a part of their self-definition. By visiting someone’s home you learn so much about them and thus are drawn even closer together. If you are a dog lover, namely a frenchie lover, let your love show for your furry little friend to everyone who visits with these ten, cute and tasteful, frenchie-friendly decorating ideas! 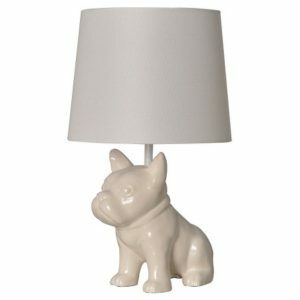 Let your love for your Frenchie shine bright with a cute and chic lamp. Great for your office desk, or an adorable accent in a nursery or kids room. 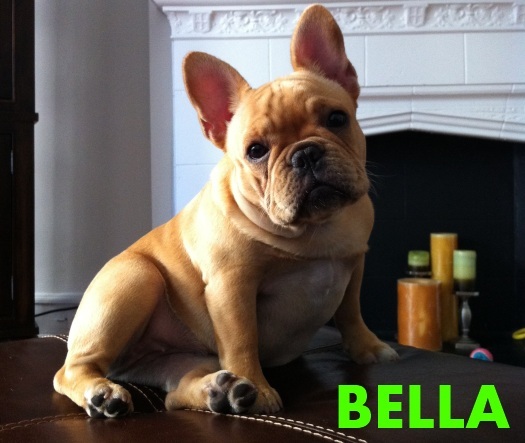 To put your Frenchie love on full display, place on a side table in the living room! This piece of Frenchie inspired art is sure to make you and all your guests smile and will add a colorful conversation piece wherever you decide to hang him. Let your pillows do the talking with this colorful and fun toss pillow. If this cute little peek-a-boo Frenchie doesn’t invite guests to cuddle up and grab a seat, we aren’t sure what will! Put this little cutie on the top shelf with all of your favorite reads. These bookends will be the one time you’ll welcome seeing anything dog-eared on your bookshelf! Guard your favorite cookies and sweets with this Threshold French Bulldog Cookie Jar from Target. We also love using it to store your pups treats as well and since it comes in two colors we suggest getting one for each! Made of sturdy stoneware for a timeless look that’s simple to keep clean, the stoneware lid seals in freshness to keep your goodies from going stale and the adorable design will bring a smile to everyone who reaches for a delicious snack. Remind your guests to wipe their paws, or feet, with a Frenchie doormat. This mat is hand painted, adding a level of quality and durability, ensuring that you’ll enjoy it for many seasons and guests to come! If you are a Frenchie enthusiast you know that any time is Frenchie time! What better way to show it than with a cute and funky wall clock? These clocks are available in natural wood, black or white frames with a backside hook for easy hanging. Choose black or white hands to match your wall clock frame, get it now at SOCIETY6! 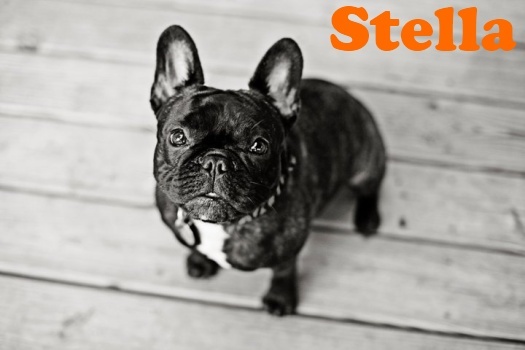 For a tiny touch of dog lovin in your home, Frenchie-themed tea towels are just the thing! They are sure to brighten up any kitchen in the dogest way! For another subtle and classy shout out to your little pup try this chic Frenchie figurine. A great statement piece perfect for any tabletop, end table, dresser or bookshelf! Or even put this little guy to work by using him as a display for your favorite jewels! Ok, you may think we’re getting carried away here, but if done right, adding some puppy style to your kiddos room can look amazingly cool and fresh! This great duvet and sheet set is the perfect mix of cute, chic and cool! Plus, what better way to keep your kids nice and cozy than some good old puppy love?!? We hope you have enjoyed all of these unique and tasteful ways to Frenchify your home and have found some inspiration to make your place puppy chic! If you are interested in purchasing any of the above items, simply click on the corresponding photo to be directed to each product’s website. Happy decorating everyone!